Chris Stewart, author of the best-selling Driving Over Lemons, on the hunt for the authentic sound of flamenco, under the shadow of the Alhambra of Granada and its dark past. In the 1970s the Spanish tourist board was happy to use flamenco, the traditional dance of the south, as a way to tempt chilly northerners on to the beaches on the Costa del Sol. And it worked - giving a much needed economic boost to an ailing economy. Back home, in Brighton and Bremen alike, crumpled posters featuring swirling skirts were rescued from luggage and left in upstairs bedrooms along with a raffia donkey stuffed with dates. Behind the swirl of skirts, however, was a dictatorship which despised the gitanos, or gypsies, who refused to give up republican beliefs, leading many into exile. A tame version of flamenco was the one delivered to foreigners - joining the clichéd image of Spain on the shelf next to the castanets. 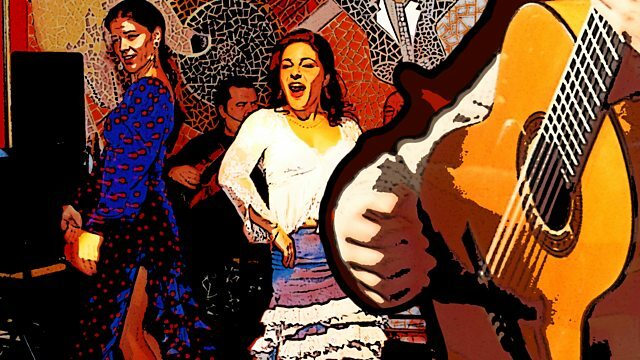 So did real flamenco survive Franco's dictatorship? It's a puzzle Chris Stewart, author of the best-selling series of books about his life as a sheep-shearer in Spain, and ex-member of Genesis, sets out to unravel on the streets of Granada. As a young man Chris left the UK to join a flamenco guitar class in Seville. He quickly realised his skills as a guitarist were lacking, but fell under the spell of Spain, and flamenco for ever, returning to live there as a farmer 27 years ago. Now he takes Radio 4 listeners on a trail through the scorching white alleyways of the Albaicin, into back room bars and caves, to find out how the music most powerfully identified with the gitanos, is now exported throughout the world. There are now more flamenco classes in Japan than in Spain. The music has made a come back, although gitano life is still often one of the outsider. Local prisons contain significantly high proportions of the gitanos, although the authorities allow flamenco workshops for those in jail as a basic human right, whilst families still pass down their skills from generation to generation. Chris meets the youngest in a long line of gypsy guitarists - Juan Habichuela Nieto performing in the open air courtyard of the Alhambra; the much lauded singer Juan Pinilla; the dancer Chua Alba, who also teaches his own daughter Chloe; the grand old man of Sacramonte, Curro Albaicin; and learns the poetry of flamenco from Steven Nightingale. Drinking more red wine than a wise man should n a hot night, he listens to the wavering song of a 99 year old Juan Mesa, accompanied by Alvaro, his 19 year old accompanist, in the dust riddled guitar shop of Rafa Moreno; before bumping into the proud bohemian, the gypsy singer, Cristobal Osorio, under the stars, concluding that flamenco is indeed the 'Blues of Europe'.